Scarce and fine antique 1940s late Art Deco / Retro style natural and undyed red coral and diamonds cluster stud earrings / ear clips. Each ear clip is centered by a fine round button shaped natural Italian Mediterranean Sardinian red coral surrounded by a cluster of old European round diamonds. Each earring has a total of 16 diamonds of just about 2.6-3.0mm in diameter. Total estimated diamond weight of all 32 diamonds is approximately 1.50 carats. The diamonds exhibit a perfect white H color and average SI1 clarity. 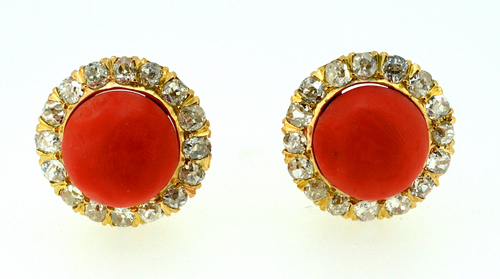 The diameter of the round corals is about 11mm (0.43") while the diameter of the earrings is 16.5mm (about 0.60"). Gross weight of the pair is 8.6 grams in 18 karat yellow gold. Scarce antique jewelry collector piece and one of the rare vintage 1940s retro design red coral and diamond earrings and jewels.